Most dive computers use real-time ambient pressure input to a decompression algorithm to indicate the remaining time to the no-stop limit, and after that has passed, the decompression required to surface with an acceptable risk of decompression sickness. Several algorithms have been used, and various personal conservatism factors may be available. Some dive computers allow for gas switching during the dive. Audible alarms may be available to warn the diver when exceeding the no-stop limit, the maximum operating depth for the gas mixture, or the recommended ascent rate. The display provides data to allow the diver to avoid decompression, to decompress relatively safely, and includes depth and duration of the dive. Several additional functions and displays may be available for interest and convenience, such as water temperature and compass direction, and it may be possible to download the data from the dives to a personal computer via cable or wireless connection. Dive computers may be wrist-mounted or fitted to a console with the submersible pressure gauge. iDive DAN personal dive computer display showing decompression requirement and other data during a dive The central band shows time to surface from current depth, stop depth and stop time. Dive computers address the same problem as decompression tables, but are able to perform a continuous calculation of the partial pressure of inert gases in the body based on the actual depth and time profile of the diver. 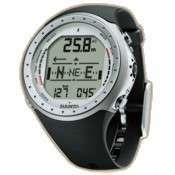 As the dive computer automatically measures depth and time, it is able to warn of excessive ascent rates and missed decompression stops and the diver has less reason to carry a separate dive watch and depth gauge. Many dive computers also provide additional information to the diver including air and water temperature, data used to help prevent oxygen toxicity, a computer-readable dive log, and the pressure of the remaining breathing gas in the diving cylinder. This recorded information can be used for the diver's personal log of their activities or as important information in medical review or legal cases following diving accidents. Because of the computer's ability to continually re-calculate based on changing data, the diver benefits by being able to remain underwater for longer periods of time at acceptable risk. For example, a recreational diver who plans to stay within "no-decompression" limits can in many cases simply ascend a few feet each minute, while continuing the dive, and still remain within reasonably safe limits, rather than adhering to a pre-planned bottom time and ascending directly. So-called multi-level dives can be planned with traditional dive tables, but the additional calculations become complex and the plan may be cumbersome to follow. Computers allow for a certain amount of spontaneity during the dive. Dive computers are used to safely calculate decompression schedules in recreational, scientific, and military diving operations. There is no reason to assume that they cannot be valuable tools for commercial diving operations, especially on multi-level dives. Dive computers are battery-powered computers within a watertight and pressure resistant case. These computers track the dive profile by measuring time and pressure. All dive computers measure the ambient pressure to model the concentration of gases in the tissues of the diver. More advanced dive computers provide additional measured data and user input into the calculations, for example, the water temperature, gas composition, altitude of the water surface, or the remaining pressure in the diving cylinder. The computer uses the pressure and time input in a decompression algorithm to estimate the partial pressure of inert gases that have been dissolved in the diver's tissues. Based on these calculations, the computer estimates when a direct ascent is no longer possible, and what decompression stops would be needed based on the profile of the dive up to that time and recent hyperbaric exposures which may have left residual dissolved gases in the diver. Examples of decompression algorithms are the Bühlmann algorithms and their variants, the Thalmann VVAL18 Exponential/Linear model, the Varying Permeability Model, and the Reduced Gradient Bubble Model. Many dive computers are able to produce a low risk decompression schedule for dives that take place at altitude, which requires longer decompression than for the same profile at sea level, because the computers measure the atmospheric pressure before the dive and take this into account in the algorithm. 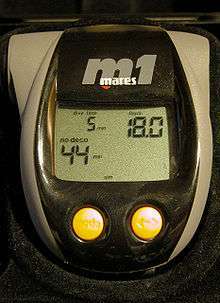 When divers travel before or after diving and particularly when they fly, they should transport their dive computer with them in the same pressure regime so that the computer can measure the pressure profile that their body has undergone. The decompression algorithms used in dive computers vary between manufacturers and computer models. The algorithm may be a variation of one of the standard algorithms, for example, several versions of the Bühlmann decompression algorithm are in use. The algorithm used may be an important consideration in the choice of a dive computer. Dive computers using the same internal electronics may be marketed under a variety of brand names. The algorithm used is intended to keep the risk of decompression sickness (DCS)to an acceptable level. Researchers use experimental diving programmes or data that has been recorded from previous dives to validate an algorithm. 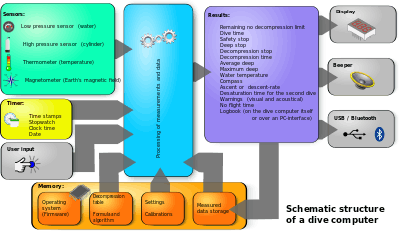 The dive computer measures depth and time, then uses the algorithm to determine decompression requirements and estimate remaining no-stop times at the current depth. An algorithm takes into account the magnitude of pressure reduction, repetitive exposures, rate of ascent, and time at altitude. Most algorithms are not able to directly account for age, previous injury, ambient temperature, body type, alcohol consumption, dehydration, and other factors such as patent foramen ovale, because the effects of these factors have not been quantified, though some may attempt to compensate for temperature and workload by having sensors that monitor ambient temperature and cylinder pressure changes. Heinrichs Weikamp OSTC and DR5: Bühlmann ZHL-16 and Bühlmann ZHL-16 plus Erick Baker's Gradient Factors deep stop algorithm both for open circuit and fixed set point closed circuit rebreather. Cochran EMC-20H: 20-tissue Haldanean model. Cochran VVAL-18: nine-tissue Haldanean model with exponential ongasing and linear offgasing. Delta P: 16-tissue Haldanean model with VGM (variable gradient model, i.e., the tolerated supersaturation levels change during the dive as a function of the profile, but no details are provided as to how this is done). Mares: 10-tissue Haldanean model with RGBM; what the RGBM part of the model does is not described in detail anywhere and is not available to the public. Suunto: nine-tissue Haldanean model with RGBM; what the RGBM part of the model does is not described in detail anywhere and is not available to the public. Technical diver wearing a dive computer on his left wrist during a decompression stop. Dive computers provide a variety of visual dive information to the diver. Maximum depth reached on the current dive. No stop time, the time remaining at the current depth without the need for decompression stops on ascent. Elapsed dive time of the current dive. Total ascent time, or time to surface (TTS) assuming immediate ascent at recommended rate, and decompression stops as indicated. Required decompression stop depth and time, also assuming immediate ascent at recommended rate. Current ascent rate. This may be displayed as an actual speed of ascent, or a relative rate compared to the recommended rate. Dive profile (often not displayed during the dive, but transmitted to a personal computer). Estimated remaining air time (RAT) based on available gas, rate of gas consumption and ascent time. Some computers can provide a real time display of the oxygen partial pressure in the rebreather. This requires an input from an oxygen cell. "Time to Fly" display showing when the diver can safely board an airplane. Maximum non-decompression bottom times for subsequent dives based on the residual concentration of the inert gases in the tissues. The ease of use of dive computers exposes the diver to other dangers. Dive computers allow divers to perform complex dives with little planning. Divers may rely on the computer instead of dive planning and monitoring. Many dive computers have menus, various selectable options and various display modes, which are controlled by a small number of buttons. Control of the computer display differs between manufacturers and in some cases between models by the same manufacturer. The diver may need information not displayed on the default screen during a dive, and the button sequence to access the information may not be immediately obvious. If the diver becomes familiar with the control of the computer on dives where the information is not critical before relying on it for more challenging dives there is less risk of confusion which may lead to an accident. It is possible for a dive computer to malfunction during a dive. If the diver has been monitoring decompression status and is within the no-decompression limits, a computer failure can be safely managed by simply surfacing at the recommended ascent rate, and if possible, doing a short safety stop near the surface. If, however the computer could fail while the diver has a decompression obligation, or cannot make a direct ascent, some form of backup is prudent. The diver may carry a backup dive computer. If diving to a well regulated buddy system where both divers follow closely matched dive profiles, the buddy's dive computer may be sufficient backup. A dive profile can be planned before the dive, and followed closely to allow reversion to the planned schedule if the computer fails. This implies the availability of a backup timer and depth gauge, or the schedule will be useless. Some organisations such as the AAUS have recommended that a dive plan should be established before the dive and then followed throughout the dive unless the dive is aborted. This dive plan should be within the limits of the decompression tables to increase the margin of safety, and to provide a backup decompression schedule based on the dive tables in case the computer fails underwater. The disadvantage of this extremely conservative use of dive computers is that when used this way, the dive computer is merely used as a bottom timer, and the advantages of real time computation of decompression status are sacrificed. The main problem in establishing decompression algorithms for both dive computers and production of decompression tables, is that the gas absorption and release under pressure in the human body is still not completely understood. Furthermore, the risk of decompression sickness also depends on the physiology, fitness, condition and health of the individual diver. The safety record of most dive computers indicates that when used according to the manufacturer's instructions, and within the recommended depth range, the risk of decompression sickness is low. Induce additional conservatism in the algorithm by selecting a more conservative personal setting or using a higher altitude setting than the actual dive altitude indicates. Many computers go into a "lockout" mode for 24 hours if the diver violates the computer's safety limits, to discourage continued diving after an unsafe dive. While in lockout mode, these computers will not function until the lockout period has ended. When this happens underwater it will leave the diver without any decompression information at the time when it is most needed. Other computers, for example Delta P's VR3, will continue to function, providing 'best guess' functionality whilst warning the diver that a stop has been missed, or stop ceiling violated. Some dive computers are able to calculate decompression schedules for breathing gases other than air, such as nitrox, pure oxygen, trimix or heliox. The more basic nitrox dive computers only support one or two gas mixes for each dive. Others support many different mixes. Most dive computers calculate decompression for 'open circuit' scuba where the proportions of the breathing gases are constant: these are "constant fraction" dive computers. Other dive computers are designed to model the gases in some 'closed circuit' scuba (rebreathers), which maintain constant partial pressures of gases by varying the proportions of gases in the mixture: these are "constant partial pressure" dive computers. There are also dive computers which monitor oxygen partial pressure in real time in combination with a user nominated diluent mixture to provide a constantly updated mix analysis which is then used in the decompression algorithm to provide decompression information. The Office of Naval Research funded a project with the Scripps Institute of Oceanography for the theoretical design of a prototype decompression analog computer. The Foxboro Decomputer, Mark I was manufactured by the Foxboro Company and evaluated by the US Navy Experimental Diving Unit in 1957. Confusion between the diffusivity coefficient and the then new concept of tissue half time resulted in a device that did not properly mirror decompression status. Had this error not occurred, the U.S. Navy Tables might never have been developed, and divers might have been using instrumentation to control their dives from 1957 on. The first recreational mechanical analogue dive computer, the "decompression meter" was designed by the Italians De Sanctis & Alinari in 1959 and built in their factory named SOS, which also made depth gauges. The decompression meter was distributed directly by SOS and also by scuba diving equipment firms such as Scubapro and Cressi. It was very simple in principle: a waterproof bladder filled with gas inside a big casing bled into a smaller chamber through a semi-porous ceramic cartridge (to simulate tissue in/out gassing). The chamber pressure was measured by a bourdon tube, calibrated to indicate decompression status. The device functioned so poorly that it was eventually nicknamed "bendomatic". In 1965, Stubbs and Kidd applied their decompression model to a pneumatic analogue decompression computer. Several analogue decompression meters were subsequently made, some with several bladders for illustrating the effect on various body tissues, but they were sidelined with the arrival on the scene of electronic computers. In 1983, the Hans Hass-DecoBrain, designed by Divetronic AG a Swiss start-up, became the first decompression diving computer, capable of displaying the information that today's diving computers do. The DecoBrain was based on A. Bühlmann's 16 compartment (ZHL-12) tissue model which Jürg Hermann, an electronic engineer implemented in 1981 on one of Intel's first single-chip microcontrollers as part of his thesis at the Swiss Federal Institute of Technology. The 1984 Orca EDGE was an early example of a dive computer. Designed by Craig Barshinger Karl Huggins and Paul Heinmiller, the EDGE did not display a decompression plan, but instead the EDGE showed the ceiling or the so-called "safe-ascent-depth". A drawback was that if the diver was faced by a ceiling, he did not know how long he would have to decompress. The EDGE's large, unique display, however, featuring 12 tissue bars permitted an experienced user to make a reasonable estimate of his or her decompression obligation. In 1984 the US Navy diving computer (UDC) which was based on a 9 tissue model of Edward D. Thalmann of the Naval Experimental Diving Unit (NEDU), Panama City, who developed the US Navy tables. Divetronic AG completed the UDC development – as it had been started by the chief engineer Kirk Jennings of the Naval Ocean System Center, Hawaii, and Thalmann of the NEDU – by adapting the Deco Brain for US Navy warfare use and for their 9-tissue MK-15 mixgas model under an R&D contract of the US Navy. Orca Industries continued to refine their technology with the release of the Skinny-dipper in 1987 to do calculations for repetitive diving. 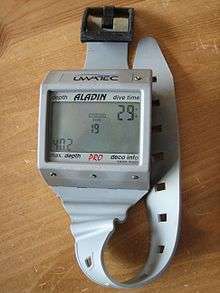 They later released the Delphi computer in 1989 that included calculations for diving at altitude as well as profile recording. Even by the late 1980s, the advent of dive computers had not met with what might be considered widespread acceptance. Combined with the general mistrust, at the time, of taking a piece of electronics that your life might depend upon underwater, there were also objections expressed ranging from dive resorts felt that the increased bottom time would upset their boat and meal schedules, to that knowledgeable divers felt that the increased bottom time would, regardless of the facts, result in many more cases of Decompression sickness). Understanding the need for clear communication and debate, Michael Lang of the California State University at San Diego and Bill Hamilton of Hamilton Research Ltd. brought together, under the auspices of the American Academy of Underwater Sciences a diverse group that included most of the dive computer designers and manufacturers, some of the best known hyperbaric medicine theorists and practitioners, representatives from the recreational diving agencies, the cave diving community and the scientific diving community. The basic issue was made clear by Andrew A. Pilmanis in his introductory remarks: "It is apparent that dive computers "are here to stay" but are still in the early stages of development. From this perspective, this workshop can begin the process of establishing standard evaluation procedures for assuring safe and effective utilization of dive computers in scientific diving." Only those makes and models of dive computers specifically approved by the Diving Control Board may be used. Any diver desiring the approval to use a dive computer as a means of determining decompression status must apply to the Diving Control Board, complete an appropriate practical training session and pass a written examination. Each diver relying on a dive computer to plan dives and indicate or determine decompression status must have his own unit. On any given dive, both divers in the buddy pair must follow the most conservative dive computer. If the dive computer fails at any time during the dive, the dive must be terminated and appropriate surfacing procedures should be initiated immediately. A diver should not dive for 18 hours before activating a dive computer to use it to control his diving. Once the dive computer is in use, it must not be switched off until it indicates complete outgassing has occurred or 18 hours have elapsed, whichever comes first. When using a dive computer, non-emergency ascents are to be at the rate specified for the make and model of dive computer being used. Ascent rates shall not exceed 40 fsw/min in the last 60 fsw. Whenever practical, divers using a dive computer should make a stop between 10 and 30 feet for 5 minutes, especially for dives below 60 fsw. Only 1 dive on the dive computer in which the NDL of the tables or dive computer has been exceeded may be made in any 18-hour period. Repetitive and multi-level diving procedures should start the dive, or series of dives, at the maximum planned depth, followed by subsequent dives of shallower exposures. Multiple deep dives require special consideration. As recorded in "Session 9: General discussion and concluding remarks:" "Mike Lang next lead the group discussion to reach consensus on the guidelines for use of dive computers. These 13 points had been thoroughly discussed and compiled the night before, so that most of the additional comments were for clarification and precision. The following items are the guidelines for use of dive computers for the scientific diving community. It was again reinforced that almost all of these guidelines were also applicable to the diving community at large." The remarkable thing about this process is that after the AAUS workshop the opposition to dive computers crumbled, numerous new models were introduced, the technology dramatically improved and dive computers became, virtually overnight, the standard pieces of diving equipment that they are today. In 2001, the US Navy approved the use of Cochran NAVY decompression computer with the VVAL 18 Thalmann algorithm for Special Warfare operations. In 2008, the Underwater Digital Interface (UDI) was released to the market. This dive computer, based on the RGBM model, includes an underwater communication system that enables divers to transmit text messages, also featuring SOS and homing capabilities, and digital 3D compass. The risk of the decompression algorithms programmed into dive computers may be assessed in several ways, including tests on human subjects, monitored pilot programs, comparison to dive profiles with known decompression sickness risk, and comparison to risk models. Performance of dive computers exposed to profiles with known human subject results. Studies at the University of Southern California Catalina Hyperbaric Chamber ran dive computers against a group of dive profiles that have been tested with human subjects, or have a large number of operational dives on record. The dive computers were immersed in water inside the chamber and the profiles were run. Remaining no-decompression times, or required total decompression times, were recorded from each computer 1 min prior to departure from each depth in the profile. The results for a 40 msw “low risk” multi-level no-decompression dive from the PADI/DSAT RDP test series provided a range of 26 min of no-decompression time remaining to 15 min of required decompression time for the computers tested. Evaluation of decompression algorithms could be done without the need for tests on human subjects by establishing a set of previously tested dive profiles with a known risk of decompression sickness. This could provide a rudimentary baseline for dive computer comparisons. As of 2012, the accuracy of temperature and depth measurements from computers may lack consistency between them making this type of research difficult. The computer must be simple to operate or it will probably not be accepted. The display must be easily read in low visibility conditions to be effectively used. The display must be clear and easily understood, even if the diver is suffering from nitrogen narcosis, to reduce the risk of confusion and poor decisions. The decompression algorithm should be adjustable to more conservative settings, as some divers may want a more conservative profile. The dive computer must be easy to download to collect profile data so that analysis of dives can be done. Other retailers sell computer clones made by Seiko (Apeks, Cressi, Dive Rite, ScubaPro, Tusa, Zeagle) or Pelagic Pressure Systems (Beuchat, Genesis, Seemann, Sherwood) or Benemec Oy (A.P.Valves). 1 2 3 4 5 Lang, M.A. ; Hamilton, Jr R.W. (1989). Proceedings of the AAUS Dive Computer Workshop. United States: USC Catalina Marine Science Center. p. 231. Retrieved 2011-12-14. ↑ Azzopardi, E; Sayer, MDJ (2010). "A review of the technical specifications of 47 models of diving decompression computer". International Journal of the Society for Underwater Technology. Society for Underwater Technology. 29 (2): 63–70. doi:10.3723/ut.29.063. Retrieved 7 March 2016. ↑ Caruso, James L (2006). "The Pathologist's Approach to SCUBA Diving Deaths.". American Society for Clinical Pathology Teleconference. Retrieved 2011-01-14. ↑ Concannon, David. (2007). "Dive Litigation in the Electronic Age: The Importance of Preserving Dive Computer Data in the Event of an Accident" (PDF). Dive Center Business. 10 (6). Retrieved 2011-01-14. ↑ Accidents and Adventures (2016). "Suunto Zoop In Depth Review". Retrieved 2016-08-07. ↑ McGough EK, Desautels DA, Gallagher TJ (1990). "Dive Computers and Decompression Sickness: A Review of 83 Cases". J. Hyperbaric Med. 5 (3): 159–162. Retrieved 2008-05-02. ↑ McGough EK, Desautels DA, Gallagher TJ (1990). "Performance of Dive Computers During Single and Repetitive Dives: A Comparison to the US Navy Diving Tables". J. Hyperbaric Med. 5 (3): 163–170. Retrieved 2008-05-02. ↑ Huggins KE (2006). "Evaluation of Dive Computer Options for Potential Use in 300 FSW Heliox/ Trimix Surface Supplied Scientific Diving". In Lang, MA; Smith, NE. Proceedings of Advanced Scientific Diving Workshop. Smithsonian Institution, Washington, DC. Retrieved 2008-05-02. ↑ Searle Jr, WF (1957). "Foxboro Decomputer Mark I". United States Navy Experimental Diving Unit Technical Report. NEDU-7-57. Retrieved 2008-05-02. ↑ Davis, M (2006). "Editor comment following article on "Automatic decompression meters": The SOS decompression meter". Diving and Hyperbaric Medicine. 36 (1). Retrieved 2013-03-28. ↑ Stubbs R.A.; Kidd D.J (1965). "A pneumatic analogue decompression computer". Canadian Institute of Aviation Medicine Report. 65-RD-1. Retrieved 2008-05-02. ↑ Stubbs R.A.; Kidd D.J (1965). "Control of decompression by analogue computer". Canadian Institute of Aviation Medicine Report. 65-RD-8. Retrieved 2008-05-02. ↑ Lothar Seveke (1988). "Entwicklung des Tauchcomputers (nur der Technik, nicht der Algorithmen)" (in German). Retrieved 2011-09-16. 1 2 Huggins, Karl E (1988). "Underwater decompression computers: Actual vs. Ideal.". In: Lang, MA (ed). Advances in Underwater Science...88. Proceedings of the American Academy of Underwater Sciences Eighth annual scientific diving symposium. American Academy of Underwater Sciences. Retrieved 2011-11-20. 1 2 Heinmiller, PA (1989). "ORCA's new Delphi computers: Impact on the diving community". In: Lang, MA; Jaap, WC (ed). Diving for Science…1989. Proceedings of the American Academy of Underwater Sciences annual scientific diving symposium 28 September - 1 October 1989 Wood Hole Oceanographic Institution, Woods Hole, Massachusetts, USA. American Academy of Underwater Sciences. Retrieved 2013-03-28. ↑ Butler, Frank K; Southerland, David (2001). "The U.S. Navy decompression computer". Undersea and Hyperbaric Medicine. 28 (4): 213–28. PMID 12153150. Retrieved 2008-05-02. ↑ "UDI - Underwater Digital Interface". UTC Corporation. 2008. Retrieved 2009-09-14. ↑ Huggins, Karl E (2004). "Performance of dive computers exposed to profiles with known human subject results. (abstract)". Undersea and Hyperbaric Medicine. 31. Retrieved 2013-09-17. ↑ Azzopardi, E; Sayer, MDJ (2012). "Not All are Created Equal: Operational Variability in 49 Models of Diving Computer". In: Steller D, Lobel L, eds. Diving for Science 2012. Proceedings of the American Academy of Underwater Sciences 31st Symposium. Dauphin Island, AL: AAUS. Retrieved 2013-09-17. Blogg, SL; Lang, MA; Møllerløkken, A (2012). "Validation of Dive Computers". American Academy of Underwater Sciences. Retrieved 4 May 2016. Wikimedia Commons has media related to Dive computers. Dive computer reviews by Dive Gear magazine.